Had an enjoyable trip to Brighton to see British Sea Power at Komedia – a venue in the North Laines area of Brighton. But of course it wouldn’t be a proper trip to Brighton without taking in some pubs. 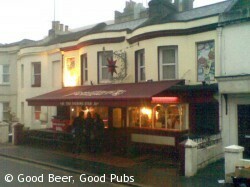 See an earlier post for a description of a Brighton pub crawl. 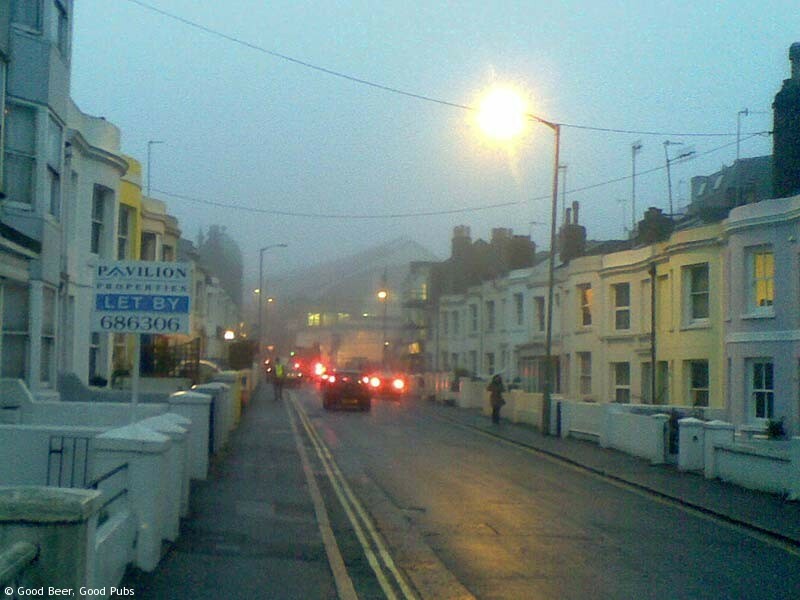 It was extraordinarily foggy in Brighton and when I arrived it was difficult to make out the country end of the platforms. It was cold too. But the dense, prematurely dark gloom only made the Evening Star even more welcome than normal. The atmosphere was lively and predominantly male this evening. The popularity meant that we were sharing a table with two other parties – something that often happens in the Evening Star. Dressed lightly for a gig the cold had got to me so my first drink was a coffee. You can choose from instant or cafetiere – choose the latter, it was superb. After that it was beer. 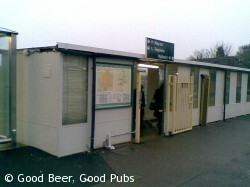 The Evening Star (pub review here) belongs to the Dark Star brewery so you expect some of their beers. Tonight the cask choices were Dark Star Hophead, Golden Gate and Sussex Original, with Milton Pegasus and another couple of guests which I’ve forgotten. Now in London (somewhere like the Harp) I’d normally opt for Hophead but here I went for the Golden Gate. After the coffee the citrus of the Golden Gate really cut through – much more so than the Hophead that Jon had. 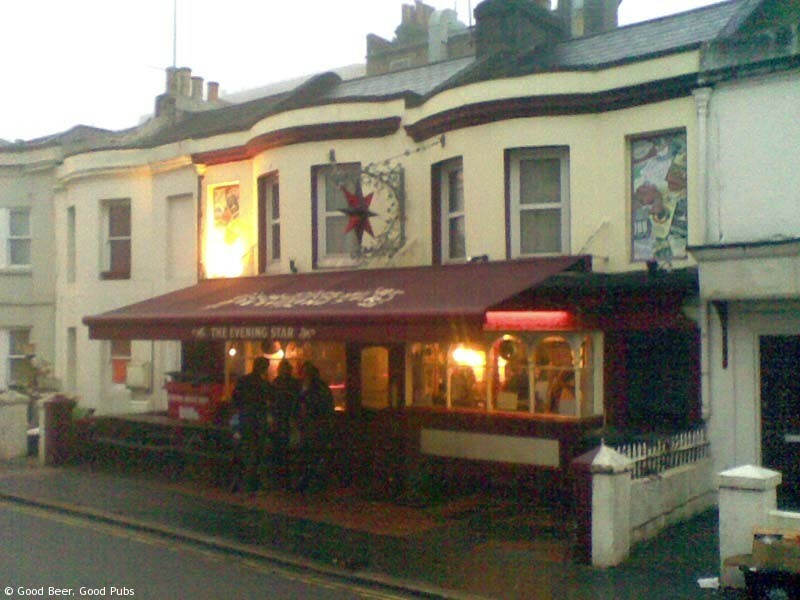 Only a brief visit to the Evening Star this time as we were hungry and wanted to eat before the gig. So back out into the gloom. 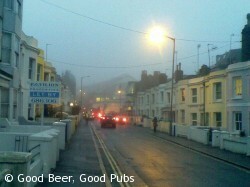 Brighton pubs are great when the sun is shining but in this dark, misty gloom they welcome you like a long lost friend. It was fully dark by the time we reached the Basketmakers so no usable pictures from my mobile unfortunately. 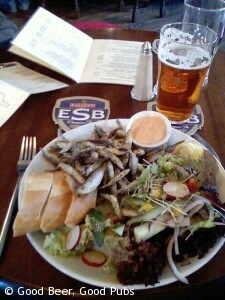 We’d chosen the Basketmakers as the food is very good – and the beer too (See my Basketmakers review). First drink was a Gales HSB while we pondered the menu. The HSB was excellent as usual although I’m sure it’s not as dark as it used to be – something I thought during a recent trip to the Royal Oak in Borough where Gales HSB is a regular guest. Comparing the colour of what we had with the HSB photo on my photo page for the Round House in Covent Garden I’d say the current HSB seems much redder. Food-wise I opted for a delicious Haddock and Chips – good portions, and well cooked. The girl at the next table was having a whole baked camembert which I’d missed on the menu but it looked amazing. 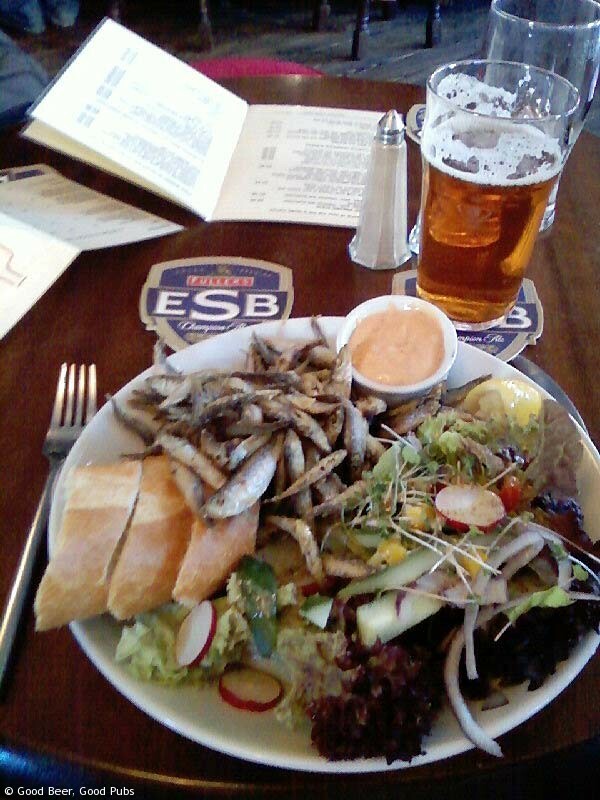 I’d imagine a whole one might be too much – you could share it with a portion of whitebait which is also good here. Just time for another beer so we tried the Castle Rock Preservation. Lighter in character than the HSB it’s still quite full flavoured but the hops are much more restrained than the Dark Star beers from earlier. It’s good to see that Fullers allow two guest beers at the Basketmakers now – the other was Butcombe Bitter. Being at two out of my three ‘golden triangle’ pubs in Brighton (we missed the Lord Nelson) of course prompted discussions about which one was best. It’s a conversation that never gets resolved but for all round appeal I’d say the Basketmakers Arms was the best pub in Brighton (that I know about). 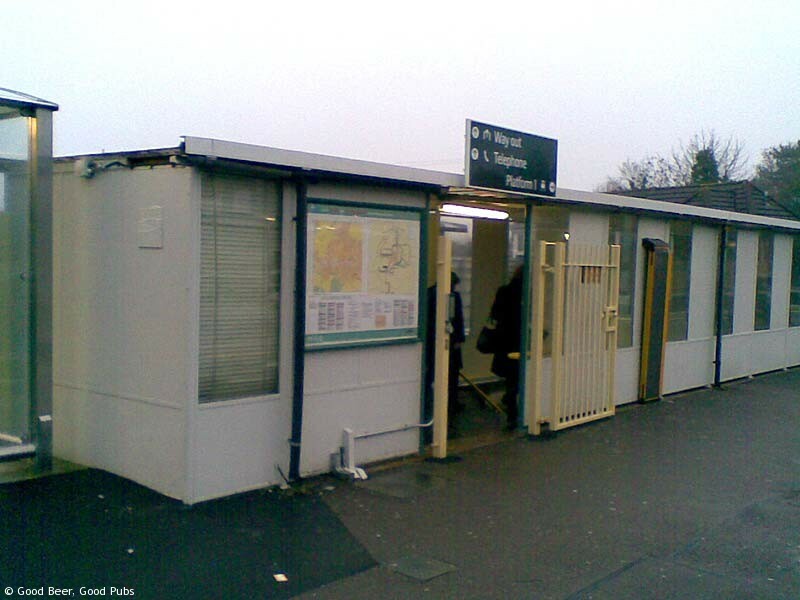 They even let children in too – a mixed blessing of course. After leaving the Basketmakers we strolled down to Komedia on Gardner Street – only to bump into a few people we’d just seen at the Basketmakers. I’d never been to this venue before but I’d definitely go again. It’s not a huge venue but it’s not tiny either. The sound and view were both superb and the placing of the bar in a separate area (like the Cavern in Exeter) makes for a better experience in my opinion. The bar sold bottles of Hepworths Sussex and Iron Horse – makes a change from Fosters etc. British Sea Power were brilliant and they played a lot from their first album as well as the new Valhalla Dancehall . A cut-down excerpt from Man Of Aran was good too. The support – Team Me from Norway were also excellent. They weaved some amazing textures and complicated rhythms in their short set and I bought their EP.